Having an RV is a wonderful experience. I’ve been driving my RV for a few years now, and I have to say that it was the best decision of my life. However, I can also say that it’s not without its challenges. For most of my adult life, I was used to driving personal vehicles around, so I never had to worry about things like electricity on the go. Beyond plugging my phone into the A/C adapter in my dashboard, I never encountered any issues. Having an RV is completely different. I can say from experience that it helps to have a basic understanding of how everything works before you head out onto the road. You don’t want to wait until there’s a problem before you learn how to fix it. So, with that in mind, I want to go over the fundamentals of your RV’s electrical system. This is one of the more crucial elements of your vehicle, so a comprehensive understanding will help you out on your next adventure. One of the most crucial elements of being in an RV is that you’re fully self-contained. While you will have to tap into the grid from time to time to recharge your batteries and refill your water tanks, you will have to make sure that your reserves are always topped off. When I first started driving an RV, I wasn’t in the mindset of living off of a battery. I was used to being able to plug stuff into an outlet without any worry about losing power. You won’t have that luxury in this kind of vehicle. So, before we begin, I have to say that the first lesson should be to realize that all of your electricity is finite. Whenever you’re on the road, you have to treat it like a precious commodity like gas or food. By that, I mean that you have to remember to get more whenever possible so that you don’t run out. If you’re like me, you might think that the battery inside your RV engine is powering some or all of your internal systems. That, however, is completely wrong. The first time I ran out of juice, the first thing I did was see if I could start the RV’s engine. To my surprise, the engine started fine, so I was puzzled when the interior lights of the coach section didn’t turn on. When checking out your RV, be sure to pay attention to the kind of batteries that are currently installed. They used to be the same type of batteries that powered the coach as well as the engine. But nowadays, they are usually using a different kind of technology (ie lead acid, AGM, lithium ion, etc). Here are a few elements to remember so that if and when you have to replace them, you will be prepared. Cold Cranking Amps: how cold it can be outside before the battery does not turn on. 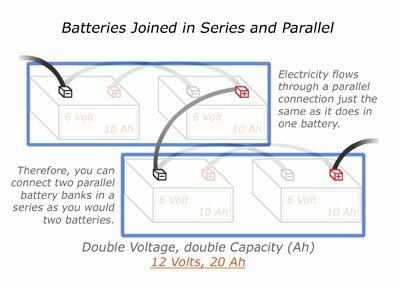 Voltage: it can get a little complicated when talking about volts versus amps, but most RV batteries are six volts instead of 12 (like what’s in the engine). Lead Acid: this is the traditional type of battery that has liquid inside of it. In the 70’s and 80’s, it was common for my dad to pop the caps off, check the water levels, and if low, he would top them off with distilled water. It’s more common today for them to be sealed batteries, but still using lead-acid technology. They’re relatively inexpensive. AGM: this acronym stands for absorbed glass mat, and it means that you don’t have to worry about fluids leaking out. AGM batteries are generally better built and require less maintenance as well. They are slightly more expensive than lead-acid batteries and are very common now as coach batteries. Lithium-Ion: these are the latest and greatest technologies for RV’s. They’ve been commonly used in cell phones and laptop computers, but the technology is now making way for them to power green cars like the Prius and Tesla. It’s still very rare to find an RV that uses lithium-ion batteries as they are extremely expensive. It’s common for RV’ers to replace AGM batteries with Lithium-Ion, at the expense of $5k – $10k. The manufacturer’s that I’ve most commonly heard that have been selling new RV’s with Lithium-Ion are Roadtrek and Advanced RV. One thing to remember is that any battery you get has to be rated for “deep cycling.” If you’re not familiar with this phrase, it refers to the fact that you need the battery for powering electrical systems, not starting a vehicle. This is why deep cycle batteries are typically six volts. 12-volt models are ideal for cars and trucks since they are used to start the vehicle. Overall, when picking out a new battery for your RV, be sure that it says it’s for deep cycling. Starter batteries are just for the engine, and they will drain too fast. Chances are that you’ve never had to pay too much attention to volts when it comes to electronics. I know that I had no clue about them untia tarted driving in my RV. When you hit the road, you will have to be well-versed in voltage basics if you hope to understand how your batteries work and what their limitations can be. Internal electricity, such as that which powers your lights and any other systems that are built-in (like a refrigerator) will typically run off of 12 volts. As I mentioned, however, you will probably be using a six-volt battery to power everything. As such, you will have to use two of them connected together to generate the necessary 12 volts. In some cases, you may have four batteries connected to provide even more power. As far as outlets in the RV are concerned, they will be operating at 120 volts. Thus, if you want to plug anything in like a blender or coffee maker, you will have to be sure that you can get that much power. Many modern RVs will have a power inverter and/or a generator for the outlets. Since you don’t want to be drawing directly from the batteries, I highly recommend using your generator when operating any devices that are plugged in. Another option is to wait until you can connect your RV to an electrical outlet so that your drawing power from the grid instead of your batteries. Before I started RVing, I had no idea about any of these different electrical terms or how they related to each other. Fortunately, it’s not too complicated to learn. Watts: the amount of power you can use at any given time. Your overall wattage is determined by combining your amps with your volts. Amp: the amount of electricity flowing through the system. Volt: the rate by which the electricity is delivered. If that still seems too complicated, think about it like this. Amps refer to how much power is coming into your system. The higher the number, the more power you have access to. Volts is a little like measuring water pressure – it refers to the rate at which you’re drawing the power. For example, if you’re using 12 volts, you won’t be draining as much power as if you were using 120 volts. The higher the voltage, the more amps required to deliver the electric current. Watts= Volts x Amps. 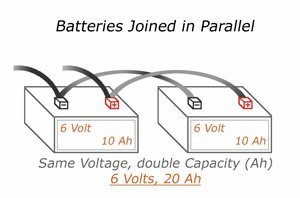 So, if you have a six-amp battery and you’re operating at six volts, you can use up to 36 watts. If you’re using 120 volts at six amps, you will have up to 720 watts available. The number of watts is mostly important when looking at electronic devices. For example, a 900-watt microwave using 120 volts will require at least 7.5 amps of power. So, pay attention to your generator and how many amps it produces when active. Since your batteries have a finite amount of energy, you will have to plug them in to recharge them. Most RVs will have either a 30-amp or a 50-amp plug. If you’re not sure, remember that 30-amp models have three prongs, whereas 50-amp have four. Using our equation from above, you can determine that a 30-amp outlet provides you with up to 3600 watts, while a 50-amp model produces up to 6000. As such, be sure to pay attention to the kinds of devices you have running and what kind of power requirements they have so that you don’t overload the system. Running the Engine: your alternator should be connected to your coach batteries. Thus, running the vehicle for a while can restore them (albeit slowly). If you have a trailer setup, then this won’t work. Some of the more modern Class B RV’s have been bolting on a second alternator to the engine just for the purpose of recharging the Coach batteries. This is advantageous as it recharges the batteries as you drive, and can recharge them while at a campsite. It oftentimes negates the need for a gas generator. Using a Generator: like your RV motor, the generator will also recharge your batteries as its working. Plugging into an Outlet (Shore Power): I highly recommend doing this as often as possible to keep your batteries topped off. The reason I like this method the best is that it takes less time, and it doesn’t eat into your fuel costs. Solar Power: if you’re worried about sustainable energy, then feel free to install a few panels on the roof of your RV. The benefit of using solar is that it will keep feeding juice into the system all day long. While it’s not as efficient as an outlet, it can be an excellent way to keep the batteries topped off. Our experience has been that with 400 amps of AGM batteries, we’ve been able to run the refrigerator, lights at night, and boondock for days without needing to charge the batteries except for what solar replenishes. Solar is a fantastic way to trickle charge your coach batteries. There are also 3 fuse boxes in a motorhome. There is the standard fusebox for the van or truck portion of your RV. Then there is a second fusebox for the coach that is 12-volt DC. And a third fusebox for the coach that is -volt AC. Sometimes, the coach has a single panel that houses both DC and AC fuses. You want to figure all of this out before there’s a problem. I also recommend bringing multiple fuses along with you on every trip just to be safe. Also, if you do blow a fuse, be sure to unplug everything and turn off all of the electricity before changing it. Doing this will not only make it safer, but it will ensure that you don’t blow your replacement as well. Once you’ve mastered all of these different components, you will never have to worry about electricity in your RV again. As I mentioned, the most crucial thing you can do is change your mentality regarding how much power you have at any given time, and never take it for granted. Thanks for reading, and I hope you found this information useful. Happy RVing!